Brittany Baldwin received her MFA from Pratt Institute and BFA from Adelphi University. 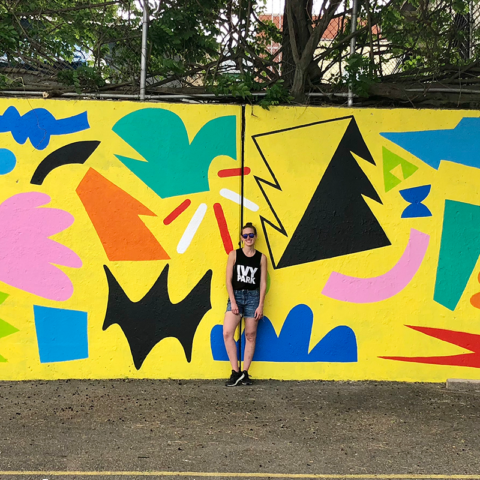 Site-specific mural commissions have included “Steinway Cypher” at Steinway Playground in partnership with New York City Parks Art in the Parks program, First Street Green Art Park, the BLVD Project, and “Bounce” in partnership with the New York City Department of Transportation. Solo exhibitions include “Serious Fun” at Pratt Institute and “Brainsugar” at Adelphi University. She has participated in several group exhibitions at the Knockdown Center, Pratt Institute, and Adelphi University. Ms. Baldwin was born and raised in Queens, NY, where she still lives and works.